If you are planning a Valentine’s Day party you might like these “holiday spread” suggestions. Come back on Sunday if you’d like to see the recipe for Valentine Salad. I’m going to make it, and I’ll let you know how it turned out. Posted on February 5, 2016 February 4, 2016 by SherylPosted in HolidaysTagged valentine's day. Some things have changed for the better over the past hundred years. 🙂 Can you imagine using the box that baking powder came in as a sherbet mold today? Apparently people back then didn’t have real molds, and didn’t have any issues with re-purposing boxes that other foods came in. Oh, I see! Well, that’s rather clever, isn’t it? Better than having a cupboard full of moulds taking up space when they were only used for high days and holidays. I approve! What a list!! Some of it sounds wonderful,and some not so much. 🙂 Ice cream or sherbets are so cute cut into heart shapes never hear of the box thing though.. I guess they wanted a square mold. This post makes me want to go out and buy some sherbet–though I’d pass of the box molds. I’d worry about the safety of re-purposing a box like this, but apparently people didn’t worry about that a hundred years ago. It sure was. I wonder how many of these foods a person typically would make for a party. 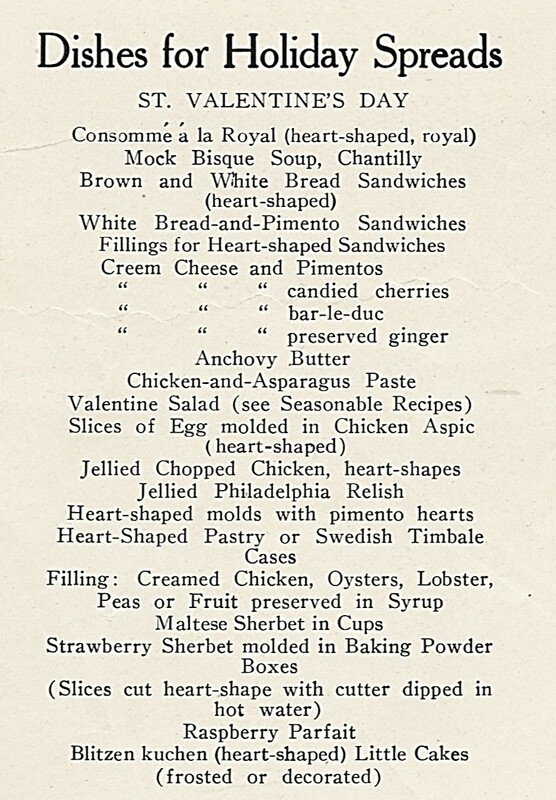 I’m surprised how many of the suggestions were for various heart-shaped foods. Sometimes I’m amazed how the aesthetics of food presentation have change over the years. Interesting collection of holiday treats. Several ingredients are new to me and quite intriguing! I didn’t know what a couple of them were either. Some of them sound intriguing–others I’m not so sure about. Looks very modern and sophisticated. I love the cream cheese suggestions. We all usually have cream cheese in the refrigerator. Some of these fillings would make a nice sandwich dinner. Love to you. GREAT job!! It’s wonderful to hear that you enjoyed this post. What a big fuss they’re making about Valentine’s Day ! Didn’t realize they took it so seriously way back then. Valentine’s Day was a popular holiday a hundred years ago. Back then people exchanged cards, and school kids had parties. I can picture many of these foods being served at women’s club card parties or luncheons. A hundred years ago there were some beautiful and very intricate Valentine’s day cards. There also were ugly (vinegar) valentines that were sent anonymously to individuals who had annoyed the sender. You might enjoy a post I did several years ago– Valentines: The Good, the Bad, and the Horrid. How . . . intense! That’s a lot of trouble to do to for Valentine’s Day–way more than a heart-shaped box of chocolates! I had to go look up bar-le-duc–I’d never seen that phrase–it’s a kind of currant jelly! Thanks for looking it up. I didn’t know what it was either. I agree! It’s wonderful to hear that you enjoyed this post. I’ll be interested in hearing how these turn out! Although I remember eating white bread and pimento cheese sandwiches when I was a kid. We had plenty of pimento cheese sandwiches when I was growing up. And I still like them but don’t make them. If I did they would be with whole wheat bread! I can’t remember ever seeing pimento cheese. I wonder if it was a regional food. Perhaps it was regional. I grew up having lots of pimento cheese sandwiches made with white bread. These are some endeavors for Valentine’s Day. All I do is make heart shaped cookies from my grandmother’s tea cake recipe.